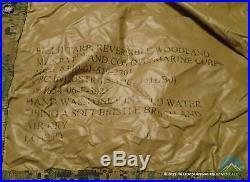 USMC Reversible Wet Weather Tarp. Genuine US Military issue. The USMC Field tarp is a camouflaged, wet weather, protective tarp that is an excellent choice of gear to add to your supplies. Wondering how you can benefit from this? Here’s a few examples of how versatile this tarp is and why it’s an important piece of gear to have. Ground cover or as a tent footprint. Use it as shelter instead of carrying a tent. Save yourself a backache from an overloaded backpack. Need an emergency shelter. Click here for tips on how to make a Tarp Shelter. Keep your stuff dry. Provide shade from the harsh sun. Use it to carry an injured person. Keep in the trunk of your car for an assortment of emergencies. You will receive (1) Tarp. Color/Pattern: Digital Marine Pattern (MARPAT) Reverse side is Coyote. Waterproof: Will keep you and your gear dry. Both Abrasion and Flame resistant. Made Non-reflective nylon fabric. Durable and lightweight (around 2 lbs). Reversible: 2 options for blending into your environment. 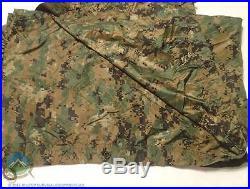 Digital woodland Marpat on one side. Flame resistent, Urethane coating, Coyote brown on the other side. 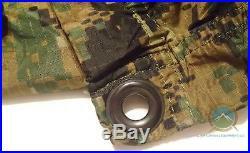 Eight (8) 1/2 diamter black brass grommets with toothed washers used for tie downs. 24 snaps lining the hem so you can add another tarp by snapping them together. Approximate size of 80″ x 90″ offers you plenty surface area to work with. Made in the USA. These may show some signs of use but will be in really good condition with lots of use left in it. Signs of use may include things such as some fading or discoloration, scratches or wear on hardware. These may contain small pin holes or small cuts in fabric. Bungee draw cords are likely missing. NSN may be faded or missing due to ink fading or vinyl lettering falling off from use. Could have soldier’s name or other government markings on it. Click here to see our. Hilltop Tip : Paracord makes an excellent replacement cord. We carefully pack to make sure your items will arrive safe and sound. Once it leaves us, its in the capable hands of our postal workers. If you prefer priority service, please select it at check out. Please remember that the responsibility of making sure your address is correct is yours. Until now, weve never met you, and we just dont know where you live. If you are an ID thief, shame on you! We will send an invoice adjusting the S&H. They will not be the exact item you will be receiving and are used for examples and are shows as illustrations. Since we have many to sell, we do not take photos of each individual item. Errors, Boo-Boos and Whoopsies. To be as accurate as possible and eliminate errors on our listings. We do not warrant that any description, photograph, pricing, product, or other information is accurate, complete, current or error-free. We are after all humans who can make the occasional mistake. If there is an error with your order when you receive your package, please notify us right away. We ask that you give us a chance to fix any errors and to resolve the issue. These cases are handled on case by case situation. If we dont leave feedback for you right away, please be patient. Since we have a bunch of feedback to leave, we do it all at once several times a month for all of our great buyers. The sale of some knives, including without limitation “dangerous knives, ” can be restricted by law, whether federal, state or local. You understand and agree that knives can be dangerous and are potentially lethal. You assume all risk associated with ownership and use of the knife and will not hold Hilltop Survival Equipment, LLC responsible or liable for any injury that may result from ownership, use, misuse or defect. By purchasing a knife from Hilltop Survival Equipment, LLC, you also agree that you will not use the knife for any unlawful purpose. Prices for our products are subject to change without notice. Pricing adjustments, including temporary sales, will not be retroactive. We reserve the right to refuse service to anyone for any reason at any time. Or to refuse any order you place with us. We really, really would love to hear from you. Or just to say, Dude, wassup? We’re here to help. Please note that other emails we have are not monitored daily. We stand behind everything we sell. To be eligible for a return, your item must be unused and in the same condition that you received it. These items will be identified as nonrefundable in their description. Exempt items can include but are not limited to. DVDs, Books and manuals. Certain health, hygiene, and personal care items. Yummy and Non-yummy food items. So, as the saying goes, If you break it, you bought it. Although technically you already bought it, so really, the saying should be: if you break it, you keep it! Our policy lasts 14 days 336 hours – 20,160 minutes. Sorry for being mean. Again, sorry for being mean. If you wish to cancel your order, please notify us right away. Be advised that it may be against the law to export certain military items outside the US. Remember, unless marked as new, you are purchasing used surplus merchandise. When it comes to condition, please. Know that each piece will not be exactly the same condition and no two pieces of surplus gear are alike. Therefore, we rate them in ranges of quality. We try our best to give honest and accurate ratings to our merchandise. For new items, be advised that many genuine military items do not come in individual boxes. Some new items may also be considered NOS which is New Old Stock, meaning that they are in new condition and never issued to a soldier, but that they may not have been manufactured recently. It is common for genuine military equipment to not come with instructions. Soldiers are provided these items from the central issuing facility and then are trained on the use of the items. Therefore, instructions are generally not printed for the items. Check out what else we have for sale. Find us on Facebook! Follow us for giveaways, new item alerts and useful tips. 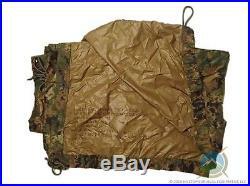 The item “USMC Wet Weather Field Tarp – Military Reversible Tarpaulin” is in sale since Friday, April 11, 2014. This item is in the category “Sporting Goods\Outdoor Sports\Camping & Hiking\Emergency Gear\Other Emergency Gear”. The seller is “hilltopsurvivalequipment” and is located in Lewis Center, Ohio. This item can be shipped to United States. 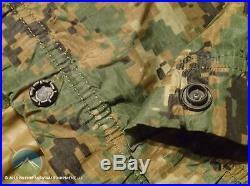 This entry was posted in usmc and tagged field, military, reversible, tarp, tarpaulin, usmc, weather by admin. Bookmark the permalink.